Note the significant decline in distillate yield, just going from 39 API Gravity to 42 API gravity (which is the upper limit for WTI crude oil). 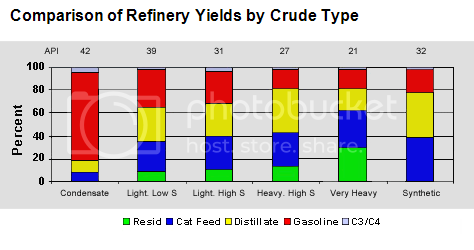 As I discussed up the thread, quite apart from refineries' ability to process high gravity condensates, I think that the real limiting factor regarding condensate demand is the demand for the full spectrum of refined products, i.e., there is a limit to how much condensate that refiners can take, if they want to meet the demand for the full spectrum of refined products--regardless of their ability to process condensate. If memory serves, I think that approximately 40% of US Lower 48 C+C production exceeds the maximum limit for WTI crude oil, 42 degrees. Unfortunately, we don't have any good global data for actual crude versus condensate, but I think a good way to illustrate the post-2005 change is the difference between the 2002 to 2005 rates of increase for global gas and global C+C versus 2005 to 2016 (see chart above). Since condensate is a byproduct of natural gas production, it stands to reason that most, if not all, all of the post-2005 increase in global C+C production consists of condensate. Note that when we ask for the price of oil, we get the price of actual crude oil, generally WTI or Brent, but when we ask for the quantity of oil, we get some combination of actual crude oil plus partial substitutes--condensate, NGL and biofuels--and January, 2018 EIA data show that about 44% of US Lower 48 C+C production exceeds the maximum limit for WTI crude oil, 42 degrees. I think its great to know that there is an oil condensate, so I do not have to panic in thought about when the oil runs out. If President of the United States Donald Trump is selling our oil to the Euros, I really need to talk to him about buying those wells down in Venezuela. That will surely help keep the prices more affordable.